Yes, I'm pulling another LolCat for the day. Today was one of those days where stupid people ruled. Now, I'm not one to even use that word. Growing up, "stupid" was a bad word. Even now, I don't use that word around my mom, and if I do, I start with "I know you don't like this word" or "I'm sorry for saying it, but..." And it's very rare, in general, because I prefer not to call things or people "stupid." Today, though....they were stupid. It was stupid actions one after another and I couldn't even laugh about it any more. So today's picture....yeah, stupid. 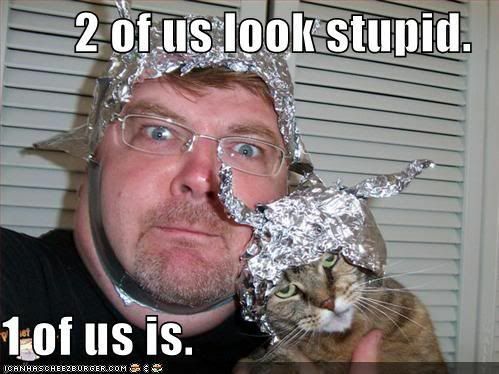 The real question is, are the tin foil hats effective at keeping out the alien rays?